I'm sure you have guessed this one right off the bat! Its kind of obvious isn't it? Lets get to the post then so you will know you were right! Africa anyone?! Hehe thats what I thought! 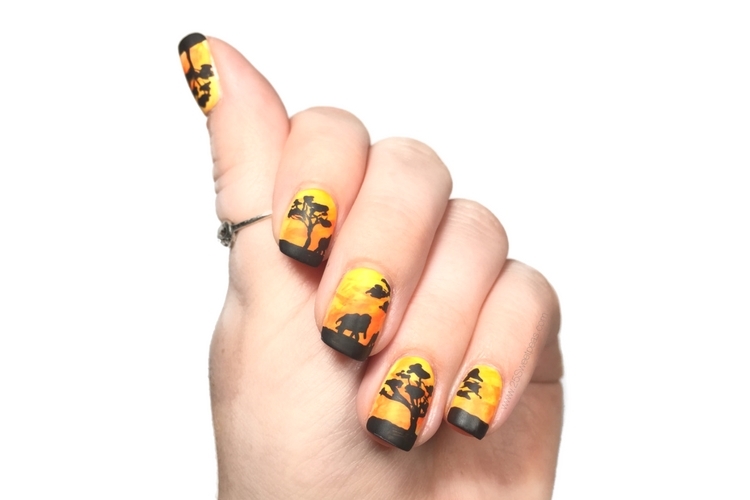 Of course I had to do an African sunset mani! I love doing looks like this with silhouettes. Why? I don't really know honestly but I do! I was nervous about the elephants but they actually look like elephants. Well actually I am just realizing in the photos you can really only see 1 but there are 3. 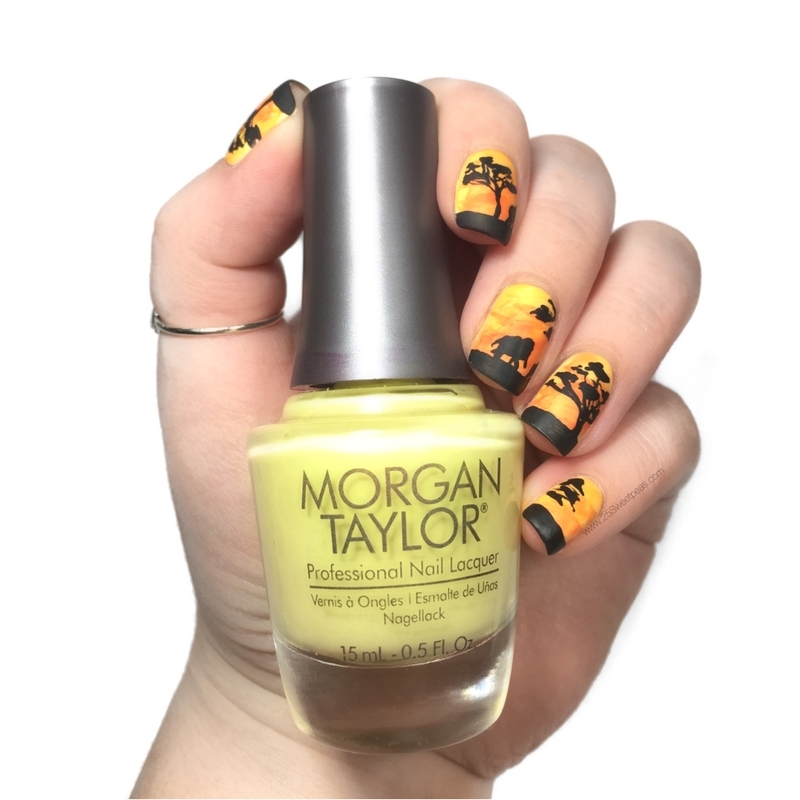 I used Morgan Taylors Day's in the Sun! I then used watered down acrylic paint to create the sky gradation with a paint brush. I was hoping I could get more of a natural, cloud like look by using that method verses the typical sponge method. The black detail was then all freehanded using the black handled brush from this post. With acrylic paint of course and then all topped off with a matte top coat. I had a lot of fun with this. I really do think this week has been helping. With the way Instagram has changed, and the way I want my blog to be I think I've gotten in my head a bit too much ya know. I need to get out of it for sure, slowly working on it. As for the Instagram dilemmas, I think a lot of people are getting fed up with it. I can't even count how many different people I have seen post about how they just aren't getting the same joy out of it anymore. So I really do think something needs to change just not sure what. Well that is it, I best stop myself before I get to caught up in my IG rant. Ekkk, yes gotta go. Maybe I'll order some polish! Ha. See you tomorrow! Base is very beautiful. look really natural. I am totally in love your manis. Thank you so much! :) These were actually a lot of fun to do! Wow! This was freehanded!? Amazing! Your elephants are too cute! 100?% Freehanded! Ha, I can't stamp what so ever! Thank you so much! These were so fun!!!! Thank you! I was afraid it was going to be a bunch of blobs! Ohhh, I love this! The background turned out so well! The sunset is so gorgeous!